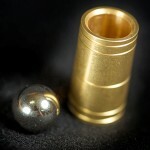 You show the brass tube and the steel ball the ball is clearly too large to fit in the tube. However on your command the ball slowly sinks down into the tube. Now on your command the ball slowly rises back to the top of the tube. You now immediately hand out the props for examination. They will find nothing and will not be able to get the ball to go into the tube – it won’t fit. No switching!